As of yesterday, Ashlynn shed the last piece of her babyhood. Her mouthpiece. Since turning 2 she's said good bye to diapers, her crib, and now her pacifier. It's actually going smoother than I thought, but I also knew she was fully ready and capable too. For probably a year, maybe longer, we've made it a rule that her paci is for sleep only. When she wakes in the morning, it gets left in the crib. If she'd bring out, we'd make her put it back. Because she's been so compliant, we've let her have it longer than any pediatrician or dentist would probably recommend, but hey sometimes you choose your battles. I've read countless tales of how to get your child to ditch the crutch, everything from saying it's lost, making them throw it away ceremoniously, having the "binky fairy" come and leave a big kid present in return, you name it. So for months now, I've been telling her binkies are for babies. And if she'd like to give her binky to the babies, she could get a present. I'd ask her what kind of present she'd like, hoping for something small, but willing to give her a bicycle if asked. Her reply, purple. Of course she's remembered this conversation, because her memory is INSANE. And she'll frequently tell me, "Binkies are for babies. Present. Purple Present. For Christmas." Because I think when I would ask "Would you like to give your binky to the babies?" and she say "No", I'd say, okay "maybe for Christmas", since that was the deadline I imposed upon myself. A month or so ago, her pacifier had fallen behind the crib and when she went to nap and couldn't find, I took the opportunity to say, try sleeping without it. That didn't go so well, and after 20 minutes of tears and protests and me having to keep coming back to her room, I dug it out and gave in. Whenever we leave school and she hears babies crying in the baby room, she'll tell me "Baby needs a binky" and I'll tell her "Yes, binkies are for babies". On Tuesday, driving home from the grocery store, she tells me the routine out of nowhere "Binkies are for babies. Present. I get a purple present". I tell her she can have a purple present, knowing I have the Elsa and Anna Toddler dolls stashed away for Christmas, but ready to use them at a moments notice, I say "Would you like a purple present like a purple Rapunzel doll?" She says "yes" with glee. I say "or would like an Elsa doll?" Which she freaks out. I didn't get to put her to bed that night, so we didn't get the chance to try a night without. Yesterday at nap, we decided... meaning Ashlynn was on board I took her binky and promised if she woke up from her nap and didn't use it, she would get a present. When I closed the door she cried, but when I kept coming in, and asking why she was crying (never mentioning that I knew why or the word "bink") she would just stay quiet or say something else. She never asked for it back. After her trying to protest that she wasn't tired and wasn't going to nap, I told her she needed to put her head down and stay in bed until her clock turned yellow because it was nap time, tired or not. I used some essential oils to help calm her and ten minutes later she was out. I took the Elsa doll and stuck it in a kraft paper bag stuffed with purple tulle for tissue since I promised it'd be purple and stuck it out her door. When she woke she saw it and she hasn't let go of her since. She's asked a few times, "my bink?" and tell her she gave it to the new babies who needed it and made them so happy. She asked if it went to Kenley and I told her no, Kenley already has her binky, it went to new little babies. Hoping that would keep her from stealing her sisters, something thankfully she's never done! (I used to keep their different colors to signify who's is who's, but now they have the same). We let her sleep with Elsa and I ran the diffuser in her room to help with her sleep. She slept until 7am! 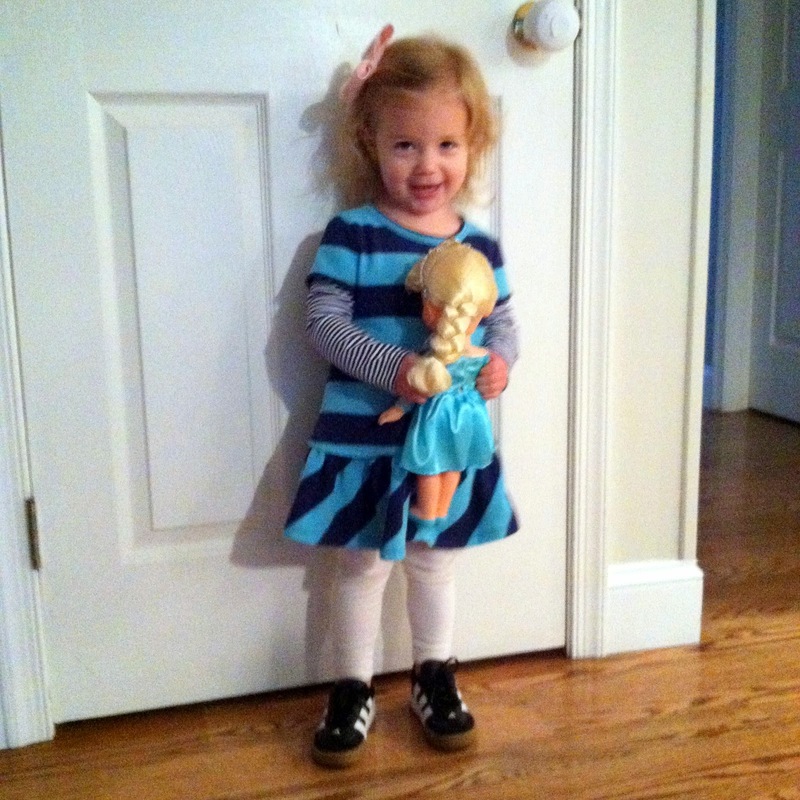 We are so proud of her, and she seems pretty proud of herself for earning a new special doll. Good job Ashlynn! You are just rolling through all these milestones! We haven't tackled any of them yet (26 months, thumb sucker not paci) and I just seriously doubt she is going to be as agreeable as it sounds like Ashlynn has been. Oh this is awesome! We still need to do it and I'm thinking we will do it cold turkey...which will be horrible, but I just don't think Ethan is that into a present to bribe him. We tried cutting the ends of some of his and he hates them, but knows there are other "good" ones around so he'll ask for those instead. Oh man! YAY Ashlynn!! and go mama for going about that in all the right ways. I love that she asked for purple present, haha. not sure bribery is the right way, ha, but I'm glad she felt in control of making the decision instead of just taking it away. Ashlynn really wasn;t so into the present either, like $100 bicycle is no different from a $10 action figure to her. I think the gift (i hope) is more to signify what she got in it's place, like I know giving up the paci is hard, but you have X now since you are big girl. big girl gift, whatever. Something to direct the attention and keep her happy when she gets sad. Which she's already looked at me with sad eyes, "my bink?" then she says "Elsa" and hugs her. So yeah, it was a bribe, but not so much like "i'll give you a cookie if you be quiet while I make this phone call" type bribe you know. Hopefully it's more of a reward, but guess thats sort of the same? One more thought! I'd love to know what E.O's you are using. I'm just getting started with them and am trying to find my way among all the information! We did potty training at 26m which I thought was early, but it was summer and I thought I'd give a shot and if didn't work nbd. She's so far as surprised me with each milestone, which I why I tried to give her more credit this time. And I sucked my thumb until I was 10!! I'm using doTerra oils. I thought about maybe doing a post of the ones I've been using on repeat and the techniques I'm learning. I'm still fairly new with it too, but really loving them so far! You and me both girl! My daughter comes by it honestly! Great job mama!! What a great way to talk about it with her for a while before actually going for it!! I've done that with most of the milestones. For potty training I talked about wearing big girl undies like mommy and going peepee and poopy on the potty, with her bed I would say a big bed like mommy and daddy's, etc. I hope it helps prepare her mentally for the change instead of just thrusting something new upon her. And in cases like this, I like to think it makes her feel more in control of the decision. Ah! Reading this gives me hope. I am so scared to break this clutch. She only uses hers for sleeping, but she puts up a fight to out it away in the morning. Lately its been better and she's been handing it to us, but I feel like I am not even ready for her to give it up. I love reading your posts. Awesome! Great job, Ashlynn!! Purple presents are the best! :) What a big kid she is now! Also, what oils do you use to help with sleep? This is amazing! I'm about to start the same battle with Sadie. We're in the exact same boat...I've let her keep them for much longer than I ever intended because she's so compliant about only using them for sleeping. I keep saying the day is coming when we have to get rid of them, but haven't pulled the trigger yet! I'm going to try your trick...wish us luck!! YAY! Go Ashlynn. Now how to break the rule breaking kid from getting into bed with mommy EVERY SINGLE NIGHT! That is the sweetest photo with her Elsa doll! I've decided it's time to get rid of the binky ONLY because she sleeps with it (keeps it in her bed when she's not sleeping) but SCREAMS for it the instant we are putting her in the car. I don't know how to break the habit of not having it in the car, without getting rid of the bink all together? Ugh, I'm terrified. Especially because she doesn't understand the concept of giving up her bink for a gift. Wish me luuuuuuck!